Hello fellow anglers, as Memorial Day weekend arrives, our local forecasters say we will have plenty of great weather to fish and have fun. Please use caution when fishing any of the rivers and streams in our area. With warming temperatures, our waters have risen and are moving very fast. They become dangerous not only from the swift moving water, but the temperatures are very frigid and can cause hyperthermia in a matter of seconds. Also a a note, all stream and rivers running into Lake Tahoe are closed to all fishing. Upper Truckee River, Trout Creek, Taylor Creek will open July 1. While venturing out beware of rattlesnakes. Yes we do have rattlers in the valleys and foothills. They have been spotted in the past couple weeks in the Jacks Valley, Carson Valley, Topaz Lake and Indian Creek areas. Be careful and be safe. there will be a lot of people out and we all need to just take our time. Remember to get your campfire permit if you are camping in an undesignated camp area. The fire danger will be very high this year. Now lets check out our local fishing report. LAKE TAHOE: Fishing has been very good on the north end of the lake. The Tahoe shelf to Carnelian Bay right at the drop off. Use a down rigger and get right on the bottom. Fish with a dodger and a minnow or a Rapala or an d-AC plug. You can also use a set of flashers with a No. 3 rainbow or brown patterned Rapala 3 feet behind it. Many limits have been coming in for average sized Mackinaws in the 2 to 5 pound range. Top lining has picked up a little in the early morning hours before the sun comes up. For more information or to set up a charter, call Blue Ribbon Fishing Charters at 530-544-6552. TROUT CREEK, UPPER TRUCKEE RIVER, TAYLOR CREEK: All streams leading into Lake Tahoe are closed to fishing until July 1,2017. SILVER LAKE (Alpine County): The lake still has ice on it and is thawing quickly. With our temperatures the lake should be ice free by the end of May. CAPLES LAKE: The lake has 2-4 feet of ice on it, with a little thinning around the edges and some open water. The resort is scheduled to be open by mid June and the lake should be ice free by or before mid June as well. No report on when the EID boat ramp is scheduled to open. RED LAKE: I received a report this week, I have not heard of in many years. Friend and fellow angler Josh Otto went up fish the lake and it was good thing he brought his ice auger. The lake still had 3.5 feet of snow and ice on it as of last Wednesday. Josh did very well with a few nice pan sized rainbow trout. He was jigging a gold Kastmaster. I recommend to always use cation this time of year on the ice. 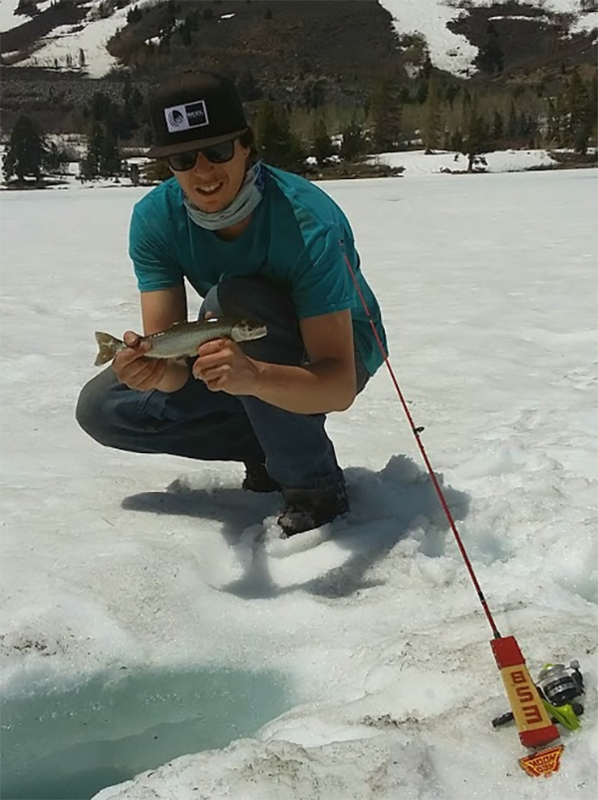 Josh is an experienced ice angler, I would not recommend the average angler venture out. CARSON RIVER EAST FORK CALIFORNIA: The river has risen two feet in the last week and is running very fast and cloudy. Use extreme caution along the edges of the river. The road was closed at the junction of Monitor Pass and Highway 4. No reports for this week due to high water. For more info stop in at Todd's Bait and Tackle in Markleeville. MARKLEEVILLE CREEK: The river has come up this last week. The fishing has been fair if you fish in the slack waters. The fish have been right on the bottom. Salmon eggs or power eggs have been most productive. Be respectful of private property when fishing the area. INDIAN CREEK RESERVOIR: The lake is schedule to be planted Friday. This fish planted is funded by the South Tahoe PUD and the Alpine Chamber of Commerce. Fishing has been slow with the recent temperatures rising. The lake is up and the algae is starting to show up as well. The campground is officially open. Power Bait or Thomas Buoyant spoons have been producing some fish. I fished with friend Tom Blotter from Minden last week. We caught 9 fish with a couple in the 2 pound class. It was hard to fish with all the helicopters buzzing us for 2 hours. TOPAZ LAKE: The lake level has been fluctuating up and down for the couple weeks. the early morning bite has been fair. As the sun rises, boat anglers need to go deeper. Best shore action has been on the California side or the farthest south area on the Nevada side. Be mindful this weekend as there will be anglers as well as skiers on the lake. If you fish the canal, watch for rattlesnakes. For more info stop in at Topaz Landing Marina. Monitor Pass is open. Ebbetts Pass is closed from Alpine Lake to the junction of Highway 89. JUNE LAKE: 8-10 Rainbow was taken on south shore throwing a silver Thomas Buoyant. Trolling Taz Devils 4-5 colors and wooly buggers weighted to 10' or so have grabbed some nice 2-4lb Cutts and Bows. Try a bugger/streamer tied to a Taz instead of hook provided with lure. I'd try this on any of the Loop lakes. 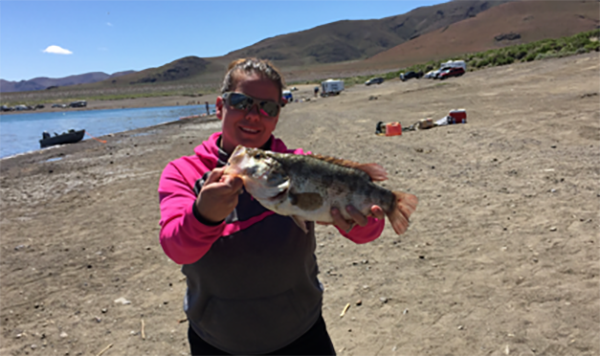 GRANT LAKE: Trolling is working with Taz pink and frog patterns 4-5 colors as well as shore fishing "the narrows" with crawlers, power baits, and chuck'n lures. RUSH CREEK: Flows are high but still workable using lures and streamers and baits in slower, deeper water. Note: As weather warms we should see an above normal winged insect population throughout The Loop resulting in excellent dry fly fishing. Check in with the local marinas and Ernie's Tackle and Ski Shop (760) 648-7756 for the gear and info needed. Good luck on your next fishing adventure.